Do You Know Drinking Suitable Things Can Also Play the Role of Anticancer? With the increasing pressure from work, more and more serious environmental pollution, the incidence of various types of cancers are also increasing, then how can people prevent or fight cancer? In fact, simply drinking coffee, soy bean milk or others can prevent and fight cancer. The newest studies have shown that drinking coffee is helpful for fighting cancer: first put aside the caffeine contained in coffee, coffee is the most important source of antioxidants for human body, followed by tea and bananas. The antioxidants help to clear away free radicals and these molecules that damage cells and DNA. There are also studies found that drinking coffee can reduce the risk of liver cancer, colon cancer, type 2 diabetes and Parkinson 's disease. Cancer experts of Modern Cancer Hospital Guangzhou suggest that people should not drink coffee more than 2 cups a day. Studies shows that after menopause, if women don’t taken any hormone drugs, anticancer effects of coffee will be more obvious on them. As for why coffee has anti-cancer effect, we still cannot clearly figure it out. It may be due to that coffee can reduce the level of estrogen, so that it can further reduce the risk of female cancers. American Cancer Research Association point out that frequently drinking soy bean milk will greatly reduce the risk of breast cancer. This is because there is a substance like estrogen substances contained in the soy bean milk, called “soybean isoflavone” which has very similar anticancer mechanism of the anticancer drugs. It has preventive effect on all cancers that relate to estrogen, such as breast cancer, endometrial cancer, cervical cancer, etc. However, Cancer experts of Modern Cancer Hospital Guangzhou remind that patients who have been diagnosed with the above-mentioned cancers, should not drink soy bean milk as it stimulates cancer cells. 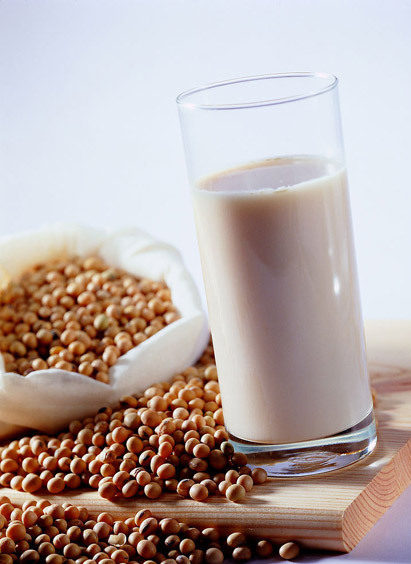 Besides patients suffering from peptic ulcer, gastritis or uarthritis, should also drink less soy bean milk. 3.Drink 6 glasses of water a day, the risk of cancer will be reduced by half. Studies have shown that drinking 6 glasses of water a day (240 grams per cup), the risk for men to suffer from bladder cancer would reduce by half; for women to suffer from colon cancer would be reduced by 45%. This is because water can increase the number of urination and defecation, so that discharge the harmful substances that may irritate bladder mucosa or colon, such as urea, uric acid. 4.Four cups of green tea a day can prevent a variety of cancers. Research has found that 4-5 cup of tea daily can reduce risk of cancer by 40%. Studies also show that oolong tea, green tea, black tea have good preventive effect on oral cancer, lung cancer, esophageal cancer, liver cancer, etc., among which, green tea like lungching (dragon-well) tea, biluochun tea and Mao Feng tea have the most significant effect, as their anti-cancer ingredients are 5 times of that of other tea leaves. Cancer experts of Modern Cancer Hospital Guangzhou remind: the above are recommend by experts for cancer prevention, however, if cancer has been found, you need to promptly go to the regular hospital for treatment.